Family Engagement Coordinator Scarf is On the Move! In July 2016, NCDB hosted a training for the state deaf-blind project Family Engagement Coordinators. For many of the attendees, it was their first time to meet in person. As an icebreaker activity, we used a ball of yarn and tossed it across the circle to allow everyone to introduce themselves. Each time someone would toss the yarn, they would hold onto of a section of the string, thus creating a large web. The web then became a symbol of the support that Family Engagement Coordinators need to provide to one another as well as the support they give to families in their state. 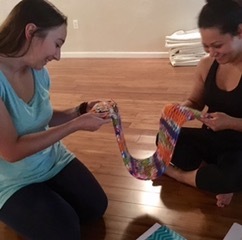 After the training, a young woman from Texas (who experiences combined vision and hearing loss) took the string and wove it into a scarf. 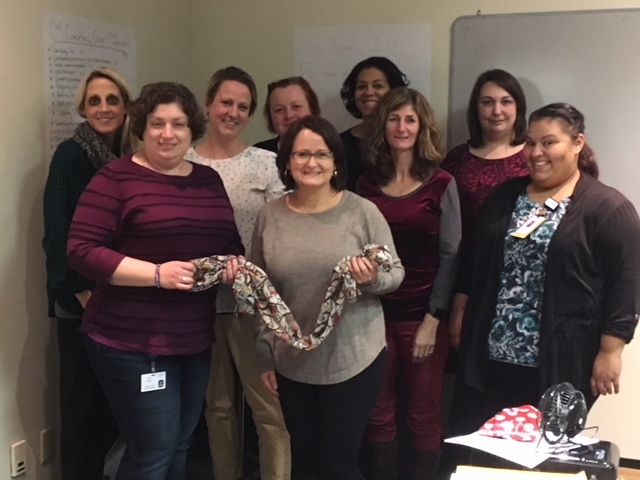 Now the scarf is taking a trip around the nation so Family Engagement Coordinators can take it to events and activities in their state. Why are we doing this, you ask? So that, over time, we can meet the wonderful people serving in this vital role and learn more about the array of activities and support that they provide to the amazing families in their state. Follow along and journey with the scarf by reading the stories below. We hope that you enjoy! Hello from Missouri. 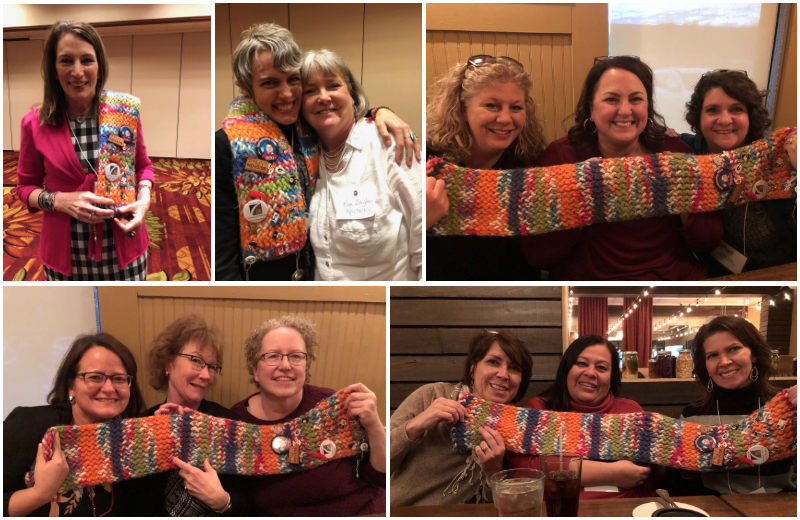 We enjoyed the NCDB colorful scarf with all the cool pins from various parts of North America, at our March 2019 VIISA Training. The VIISA Project is from the SKI Hi Institute at Utah State University. The VIISA Project provides resources for family centered interventions for infants, toddlers and preschoolers who are visually impaired. Through the training, participants obtain lots of relevant and useful information, including hands on resources for working with children who are visually impaired and with additional disabilities, including deafblind. 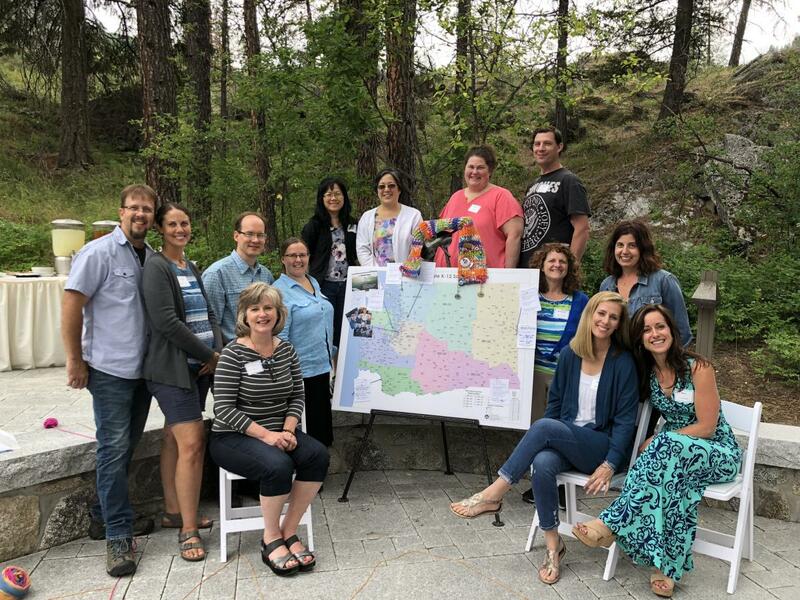 The VIISA participants from across the state, just as the NCDB FECs from across the country, all learned from and collaborated with each other, and truly enjoyed coming together while learning. The scarf added nicely to our training and was a wonderful way for us to celebrate our accomplishments. At the 2019 Deaf-Blind Summit, several Family Engagement Coordinators were able to be together to learn and share. If you are a family member of an individual with deaf-blindness and you have not met the person serving in this role for your state deaf-blind project, you need to make sure to connect with them! These remarkable individuals work very hard to support the needs of families in their state and are eager to meet you. 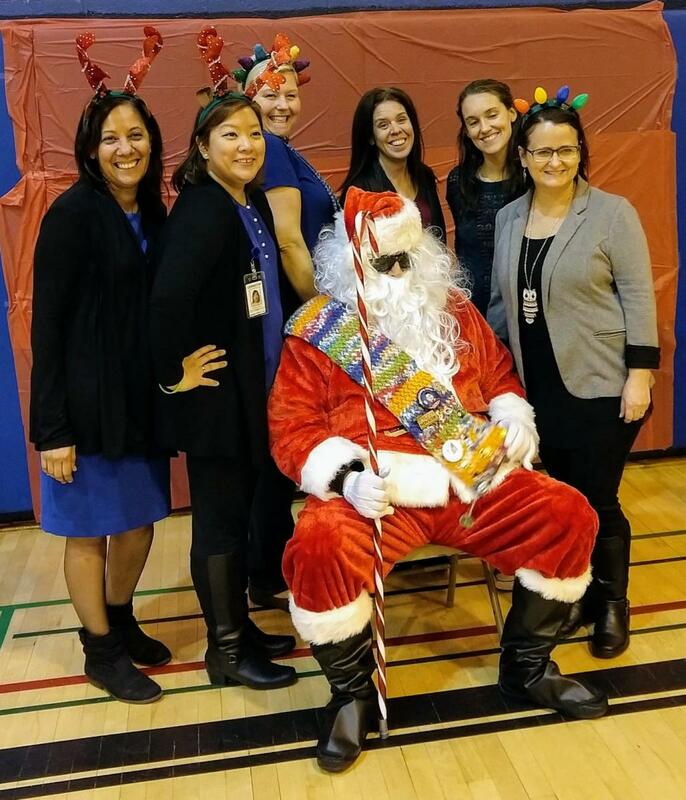 Silvia Verga, Suzanne Chen and some of the NYDBC Parent leaders with Santa. All children received a gift from Santa who happens to be deaf-blind; professional family photos were taken by one of our Parent advisors who is a professional photographer. CHARGE Foundation, NFADB, HKNC, ICC were represented. A huge thanks to NYPADB for collaborating with NYDBC to make this event a wonderful experience for the families. 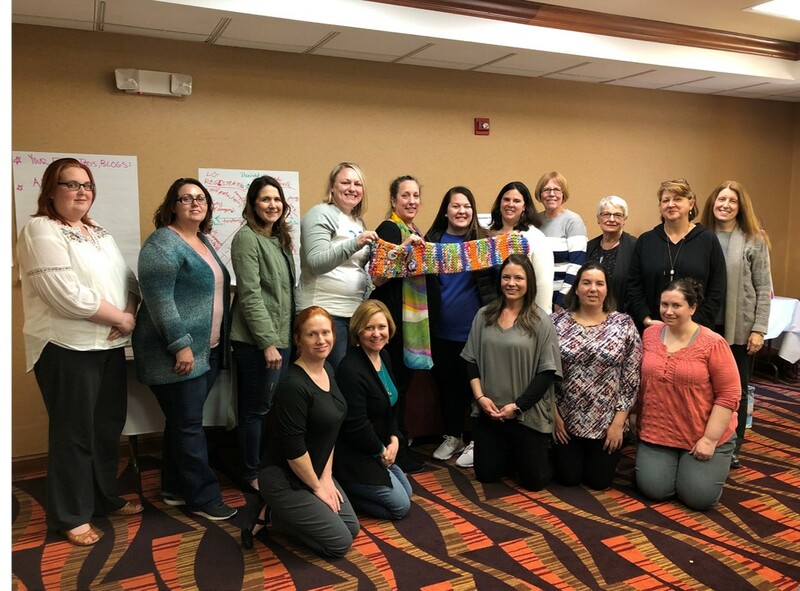 The New York Deaf-Blind Collaborative held a Family Leaders Planning Event on November 28, 2018 in Buffalo, NY. On the agenda was an overview of NYDBC Family & Consumer Engagement Initiative (F&CE) plans, an opportunity for shared group discussion, and Shannon McCracken provided an overview of Parent to Parent of New York State's Health Care Notebook. Looks like a fun and productive time! 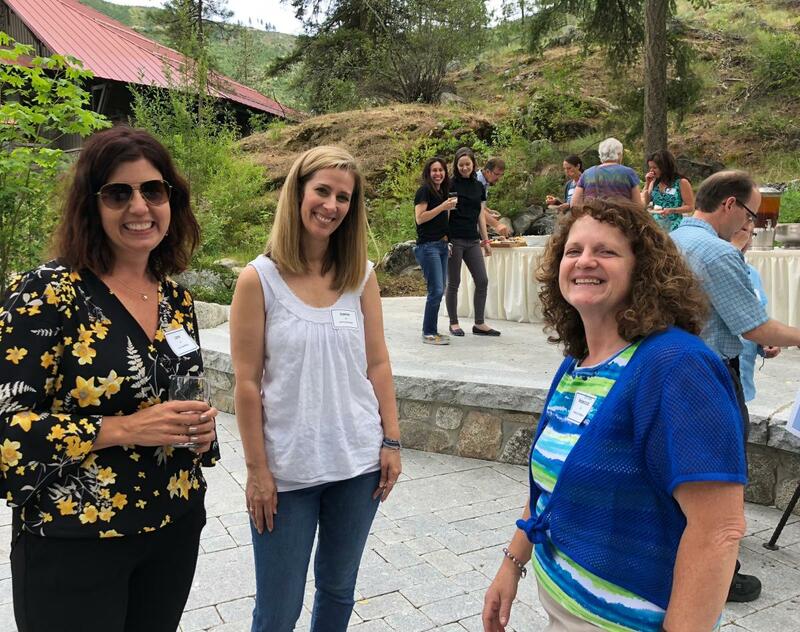 WA Deaf-Blind Project staff and parent volunteers hosted our 2018 parent networking event “Dreaming for Our Children’s Future,” in Leavenworth, Washington from June 27-28. As an opening, we shared the traveling scarf story. 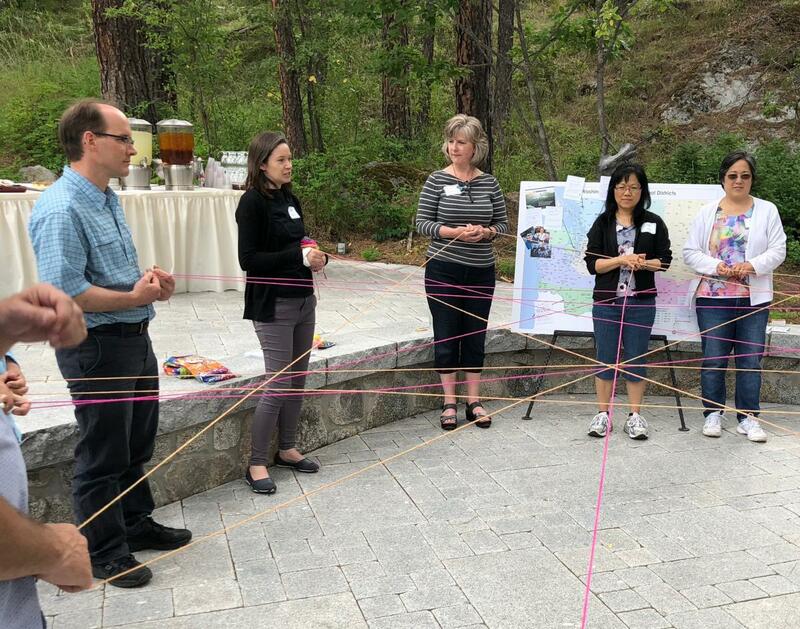 Sarah Godwin, a transition consultant, led us in the “we-are-all-connected” yarn activity for parents to introduce themselves. 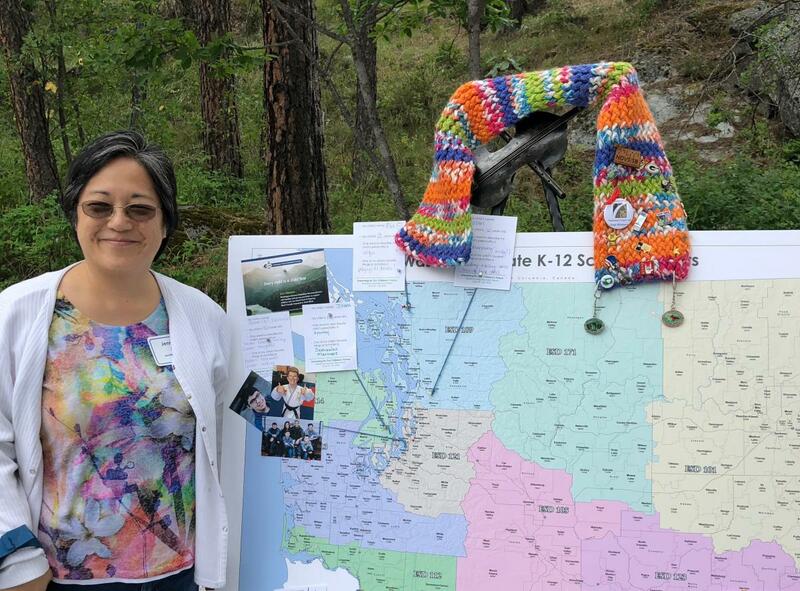 We had a map of Washington State, which is seen behind the group with the scarf draped over the top. Washington’s pins are included, now! Self-determination skills for my son, and giving him the opportunities to better express his wants and needs. Helped me know what questions to ask. That the little choices of self-determination lead to bigger ones. In April 2018, the state deaf-blind projects and NCDB gathered to talk about next steps in enhancing services for individuals with deaf-blindness at DB Summit and then went right into the first-ever Network of the Americas Conference, hosted by Deafblind International and Perkins School for the Blind. The conference was a great opportunity to network, learn and have fun with leaders in the field of deaf-blindness from North America, Central America, South America and the Caribbean. 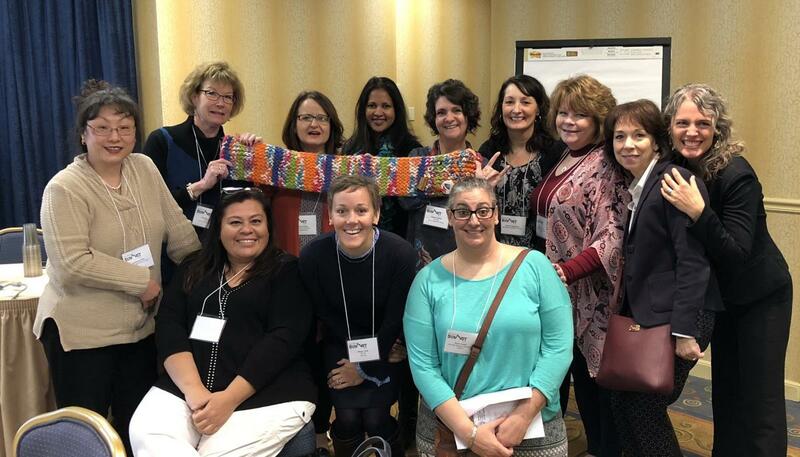 The Family Engagement Coordinator scarf traveled to North Dakota to be a part of the events for professionals and families in Mandan, ND, March 16-17, 2018, with Dr. Lauren Lieberman. The theme of the conference this year was “Let’s Get Moving”. The scarf was shared with 17 families and 85 professionals throughout the two day event. Friday was a day for the professionals to learn about inclusion and adaptations for physical education and fitness. Dr. Lieberman shared her resources and information on Camp Abilities, a week-long educational sports camp launched in 1996 for children who are blind or visually impaired. The Family Weekend was an opportunity for families who have a child with vision loss, hearing loss, or deaf-blindness, including those with additional disabilities, to work directly with Dr. Lieberman on adaptive sports and fitness. 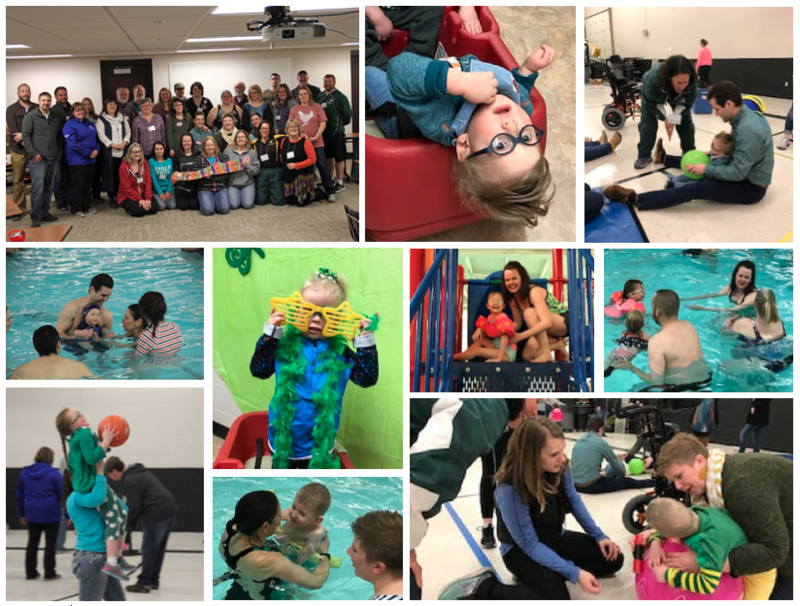 In addition, they met other families from across North Dakota and staff from ND Vision Services/School for the Blind and the ND Dual Sensory Project. Festivities began Friday night with a meal for staff and families, followed by water skills in the pool at the Brave Center. Saturday morning activities began with introductions and parent time, while the kids made bags, slime, and rainbows in celebration of St. Patricks Day. In the afternoon the kids were busy with Cosmic Yoga, Minute to Win it, and bingo! Dr. Lieberman presented to parents on setting the stage for a life time of physical activity. This was done in a fun, relaxing environment where skills were taught, then implementation of strategies specific to each child’s needs were demonstrated with hands on activities throughout the morning and afternoon in a large gym. Parents, grandparents, and siblings were included in all activities with the children! Arkansas is excited to be connected with other families throughout the state! The first picture below represents our parent groups in Central Arkansas (pictured is Jana Villemez, Jennifer Brockman, and Lashawn Hildreth). In the middle is our Family Leadership parents gathered to work on our NFADB application and becoming a strong voice for Arkansas (pictured is Jana Villemez, Loreena Hegenbart and Casey Adams!) The last picture represents some of our families in the northwest part of our state. From left to right is Oscar River, Jana Villemez, Rhonda Wolf, Kerin Rivera and her daughter Gigi, Kortney and Omar Calvillo and their son Silas. We have learned more about deafblindness in these groups, educational resources, but most importantly, we feel supported just knowing other parents and families who have graciously shared their story. 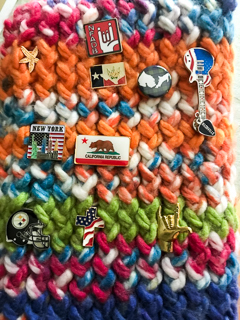 We now feel connected nationally with the traveling scarf! Thank you to NCDB for making this happen! My name is Debra Pickens and I serve as a Parent Educator for the NC Deaf-Blind Project. I am the proud mother of a son with deaf-blindness named Billy. 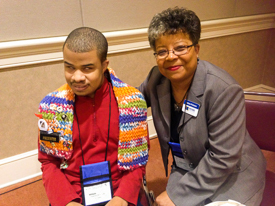 Billy and I did a presentation at the North Carolina Department of Public Instruction 67th Conference on Exceptional Children on Friday, November 17th, 2017. They really enjoyed hearing Billy's transition story, so I decided to pass the scarf on to the next generation. They too have a VOICE. Billy discussed his vision, his abilities, his disability, his transition to middle and high school and now college. He talked about the importance of concept development and social skills. He talked about his experiences during the summers with independent living skills, job shadowing and Assistive Technology training. The best gift we can give our children is to allow them to self-advocate, whenever possible. This was a wonderful experience not only for me, but also for my son. The scarf was a useful accessory as it traveled to Wisconsin the weekend of November 10-11 as snow and sleet welcomed our families to our Annual Outreach Services Family Conference. Each year, WESP-DHH Outreach sponsors an Annual Statewide Professional & Family Conference, specifically for families that have, and professionals who work with, children who are hard of hearing, deaf, deafblind, or deaf with additional disabilities. The conference offers families (including grandparents and extended family) opportunities to socialize and build friendships as they met other families from around the state, attend informative workshops, interactive learning labs and discussion groups. There were well-supervised and fun-filled children’s activities while parents attended workshops. Nancy Steele presented a keynote presentation on Literacy for All and Jodi Anderson, the Family Engagement Coordinator presented on the topic of self-care with the assistance of Heather Joy Magdelano, the Family Engagement Coordinator from Arizona’s project via Facetime. Too bad Heather didn’t share any of her weather with us! Despite Mother Nature not being the most kind to us, it was a terrific weekend of learning, sharing, and spending time with other families who understand our kids. We had 14 families of children with combined vision and hearing losses attend the conference, here are just a few in the photo. Marcy Meachum and Krista Olsen, Technical Assistance Providers for the South Carolina Interagency Deaf-Blind Project, recently attended the SC AER Conference on October 31-November 2. Also in attendance were 2 strong family leaders from SC - Minnie Lambert and Katie Sacra. While there, Marcy provided a training on Active Learning. They are pictured here with Robert Hill, Project Director for the SC Deaf-Blind Project. Looks like it was loads of fun! Kudos to Krista for having Halloween spirit and wearing her favorite T-Rex costume! 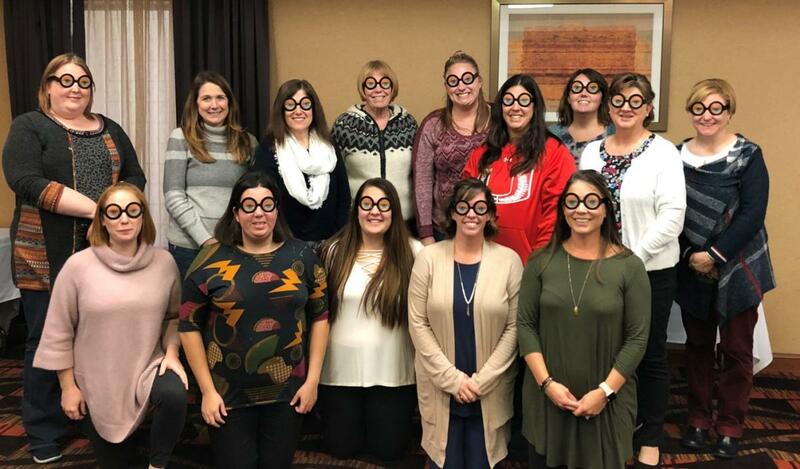 On October 13-15, the New York Deaf-Blind Collaborative (NYDBC) held a meeting for their statewide network of Deaf-Blind Parent Advisors of New York (DBA-NY). NYDBC launched this initiative in order to increase the effectiveness of child find activities, create a sustainable community of practice throughout New York State and create a network of parents that can advise the project and other families across the state. The DBPA-NY members attended the 3-day, in-person training in Albany, NY and will be expected to participate in web-based meetings facilitated by NYDBC across the course of the academic year as well as a wrap-up meeting in the spring of 2018. Kudos to this group for sharing their knowledge and time to support parents across New York! On October 20th and 21st, the National Family Association for Deaf-Blind (NFADB) met for their annual board meeting at Helen Keller National Center in Sands Point, NY. A few staff members from NCDB were honored to take part in their strategic planning. Great work and discussions were had by all. Be on the lookout for continued amazing things coming from NFADB! 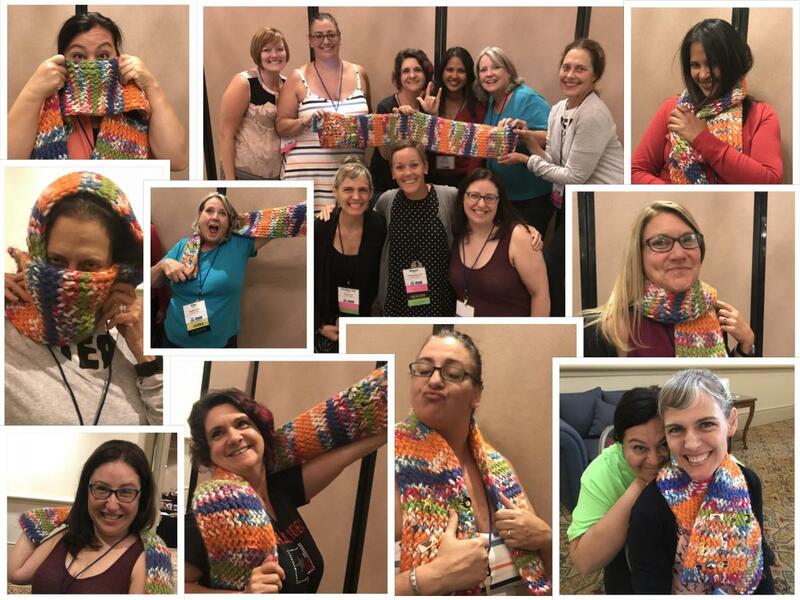 Heather Joy Magdelano (Family Specialist for AZ) writes: "I was thrilled to share the scarf with my Journey into Joy group on September 2nd, 2017! 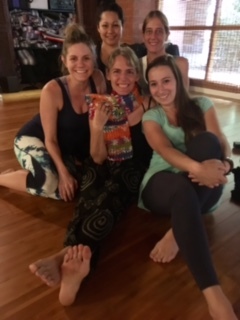 We meet the first Saturday of every month to participate in an hour and a half of relaxation and reconnection to ourselves and each other. Taking time to take care of ourselves has become a priority for all of us and has been life-changing for so many of us. We look forward to our time together each month. Having a tactile representation of NCDB and NFADB was so lovely. For the first time I saw some of the moms really connecting with the importance of these vital organizations. Can’t wait to have the scarf back in Phoenix someday (preferably when it’s not 108 degrees!)." The 13th International CHARGE Syndrome Conference: Taking CHARGE in Orlando was held July 27-30, 2017 at the Rosen Shingle Creek Hotel in Orlando, FL. Needless to say, it was a HUGE success! 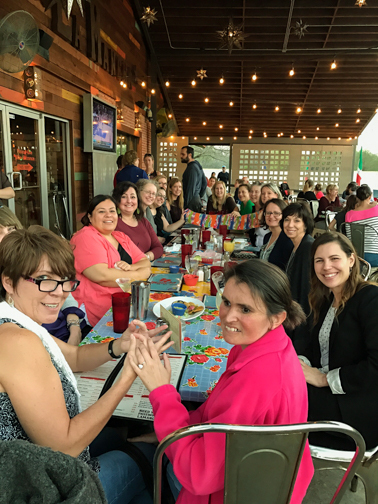 Several talented women serving in the role of Family Engagement Coordinator for their state deaf-blind project were able to attend the conference to learn and connect with one another, families, and countless other professionals. And guess what??? 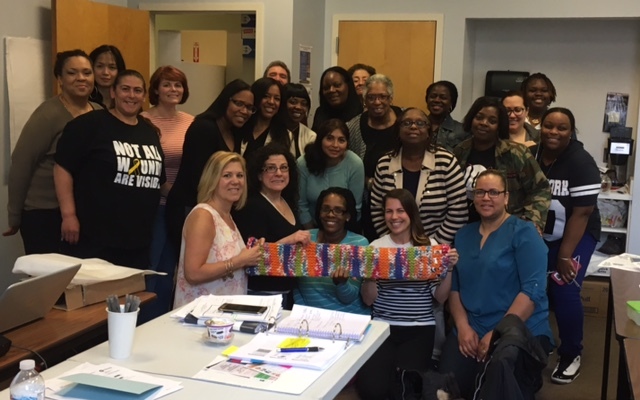 The Family Engagement Coordinator Scarf was with us the entire time! For those who missed it, you have to plan to attend the next one. It won’t disappoint! The New York Deaf-Blind Collaborative hosted their 4th Annual Family Learning Retreat July 13-16 in Spring Valley, NY for 120+ people at the Visions Center on Blindness (VCB). Activities at VCB were adapted to support all campers and encourage physical fitness, health, and wellness. They included swimming, pedal boating, fishing, tandem bikes, bocce, mini golf, crafts, music, dance, and more! The retreat offered a balance of family time and learning. Silvia Verga, Family Engagement Coordinator for the NYDBC, said that despise the rain on the first and second day, most families stayed until Sunday and everyone can’t wait to come back next year. 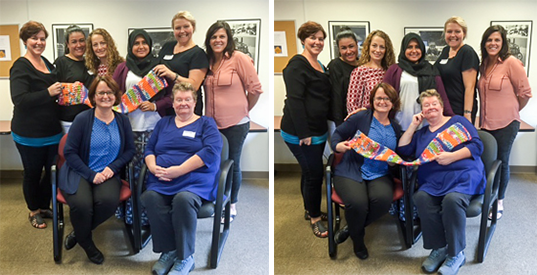 The Famous Family Engagement Coordinator scarf landed safely in the City of Champions, Pittsburgh, Pennsylvania! 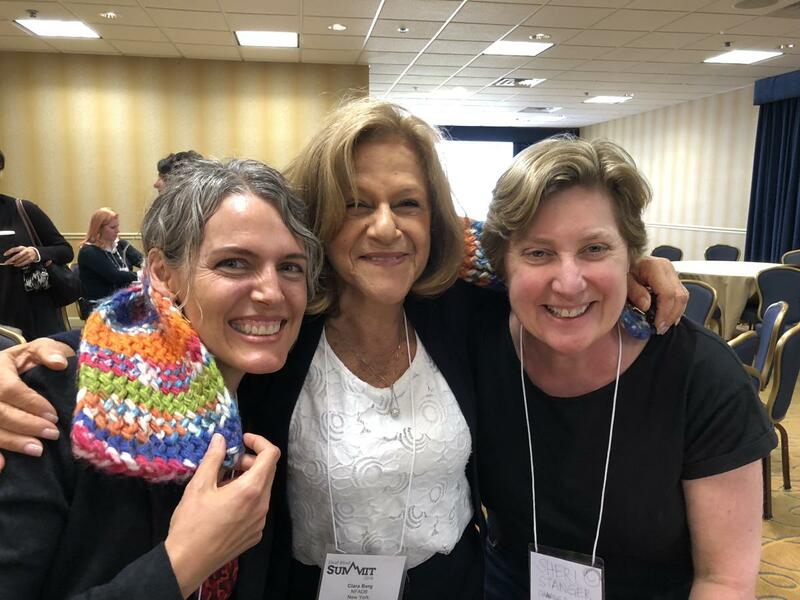 The scarf was then carefully transported to State College, PA, for the annual Pennsylvania Deaf-Blind Project Family Learning Conference, by FECs Patti McGowan and Molly Black. 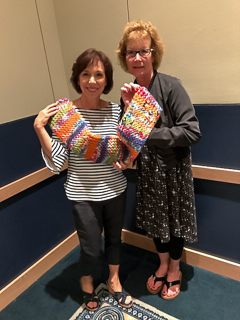 The theme of the conference this year was “Web of Connections.” The scarf was shared with 27 families, exhibitors from 6 state agencies, and 13 professional staff and guests. Throughout the weekend conference, families of children and youth with deafblindness participated in learning sessions and networking that provided them with strategies to address the impact of deafblindness on their children and families. 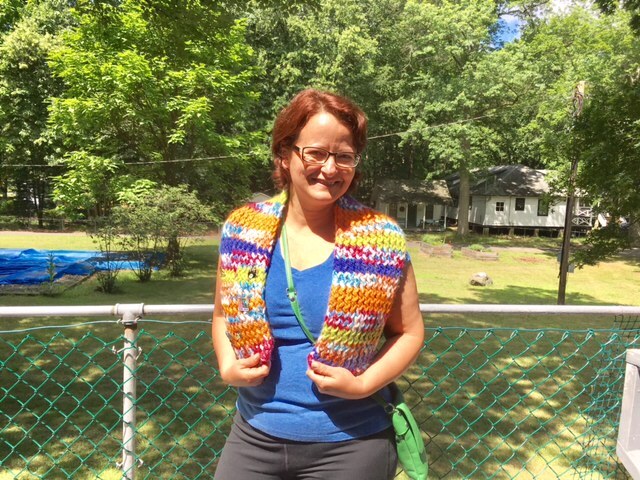 The Pennsylvania Deaf-Blind Project borrowed the great idea of the scarf and began creating a scarf of our own. 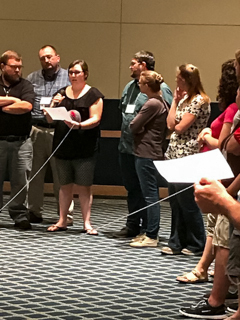 We incorporated the activity of tossing yarn from participant to participant during our opening session, “Triumphs and Challenges,” a tradition in which all participants introduce themselves and share a triumph or challenge that occurred over the past year. This might be an accomplishment by their child or a “challenge” faced by the family that they hoped to gain information and resources about over the weekend. The yarn symbolized the Web of Connections that now exists among the families who participated. Family Specialist, Carly Fredericks, is featured with SPAN Resource Parents at their intense 6-day training series where she has the pleasure of providing an overview of the state deaf-blind project the New Jersey Consortium on Deaf-Blindness and the unique needs of children with combined hearing and vision loss. 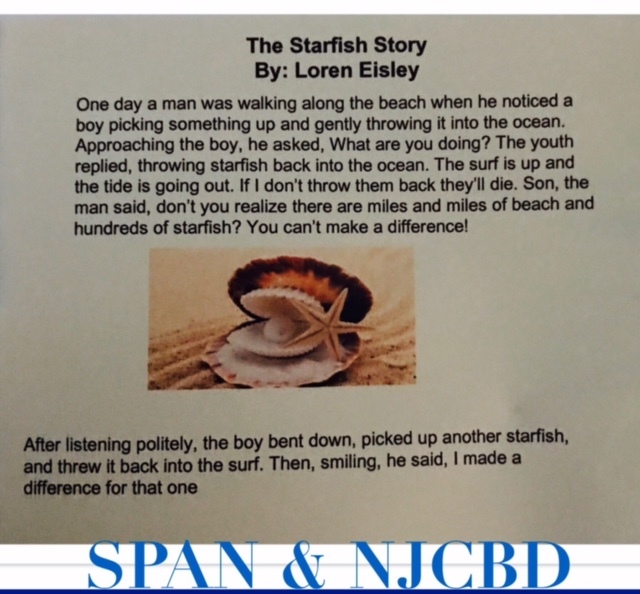 SPAN(Statewide Parent Advocacy Network) is the NJ state parent training and information center (PTI). NJCDB and SPAN are committed to their collaboration in an effort to support identification an d referral. SRP's are parent leaders are identified throughout the state that support all children with disabilities. New Jersey also included a pin that exemplifies the character of New Jersey's parent leaders! One day a man was walking along the beach when he noticed a boy picking something up and gently throwing it into the ocean. Approaching the boy, he asked, What are you doing? The youth replied, throwing starfish back into the ocean. The surf is up and the tied is going out. If I don't throw them back they'll die. Son, the man said, don't you realize there are miles and miles of beach and hundreds of starfish? You can't make a difference! After listening politely, the boy bent down, picked up another starfish, and threw it back into the surf. Then, smiling, he said, I made a difference for that one. 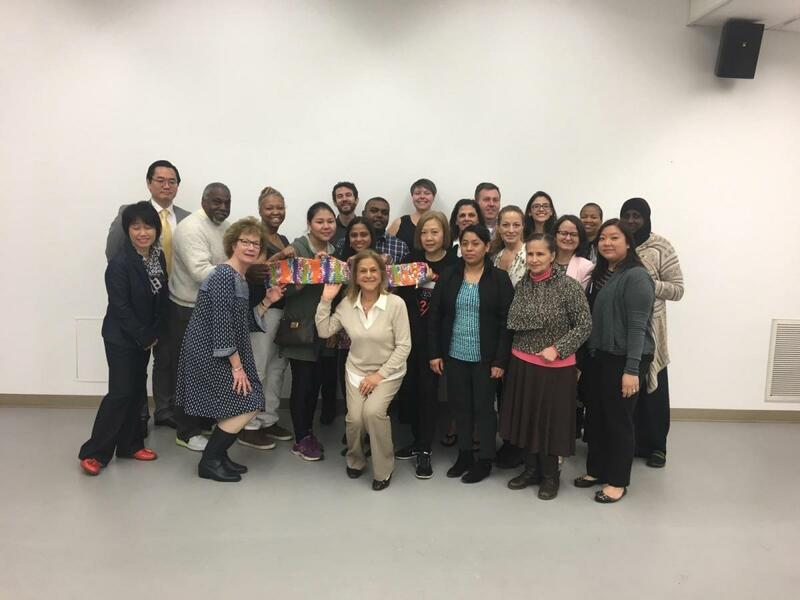 On April 2, NFADB, the New York Deaf Deaf-Blind Collaborative, and the Pennsylvania Deaf-Blind Project collaborated to provide a Project SPARKLE training at Queens College, CUNY. Parents, other family members, and professionals had a fun day of learning, sharing, and networking! The training was shared in four languages--Chinese, English, French, and Spanish--yet there were no barriers among the participants and we joined together as one to learn and support our family members who experience deafblindness. 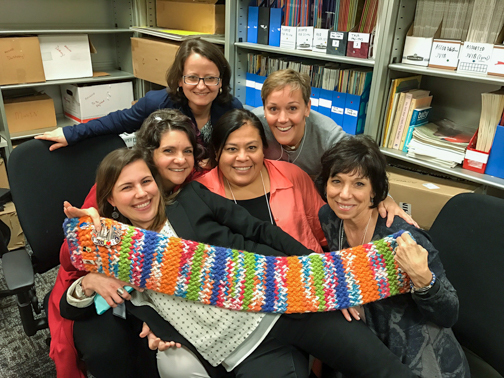 The Family Engagement Coordinator Scarf was on the move and part of this awesome group! What a treat it was to have several Family Engagement Coordinators attend DB Summit! We all gathered for dinner one evening and worked extremely hard both days sharing the parent perspective for future work of the deaf-blind network. What an amazing group of talented women! Also while in Texas, some of the members of the Grief Work Group gathered to celebrate the creation of a collection of grief resources available to families (visit NCDB grief resources for families) and the upcoming May 2017 launch of the first ever national on-line peer-to-peer support group for families of children with deaf-blindness who have died. We owe immense amounts of gratitude to Mary Espinola (NC), Molly Black (PA), Melanie Knapp (TX), Myrna Medina (CA) and Melissa Bryce-Gamble (OK) for their willingness to step out on behalf of families experiencing unimaginable loss. In February, David Brown returned to Nashville, Tennessee to present to over 75 families and professionals on "More on 'The Forgotten Senses', their importance and how to assess children." David is an expert on working with children who have dual sensory loss. We were so glad to have him back in Tennessee! What a treat! We shared the scarf with everyone there. All were inspired by the story behind the scarf. By Angie Walton, Family Specialist for Tennessee. My name is Myrna Medina, for the past 17 years I have been having the great opportunity to work as the Family Specialist for California Deafblind Services. One of my roles as a Family Specialist is to work directly with families providing support and guidance. Knowing that California is a very large state, and understanding the need of parent-to-parent support; CDBS had the idea of creating a Family Support Provider group and leadership initiative. For the past several years California Deaf-blind Services has been working to ensure that family members of children who are deafblind have access to other family members for the purpose of peers support and guidance. 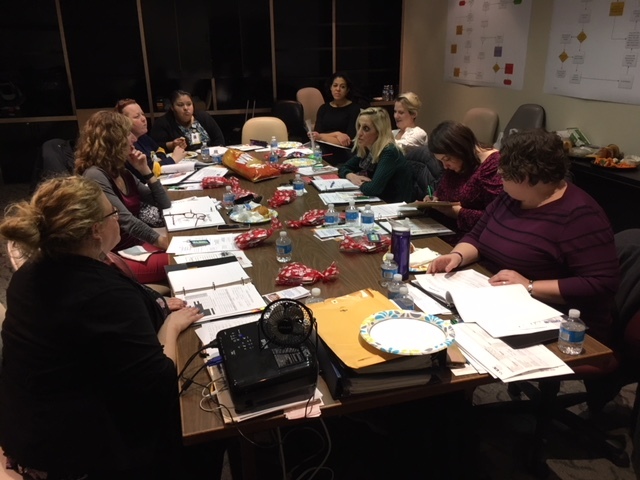 For that reason, throughout the years CDBS has identified many FSP’s statewide, that were brought together for trainings, provide resources and materials to be an effective support provider. Some FSPs have become leaders in their communities and some have even accepted different positions in various family resource centers. 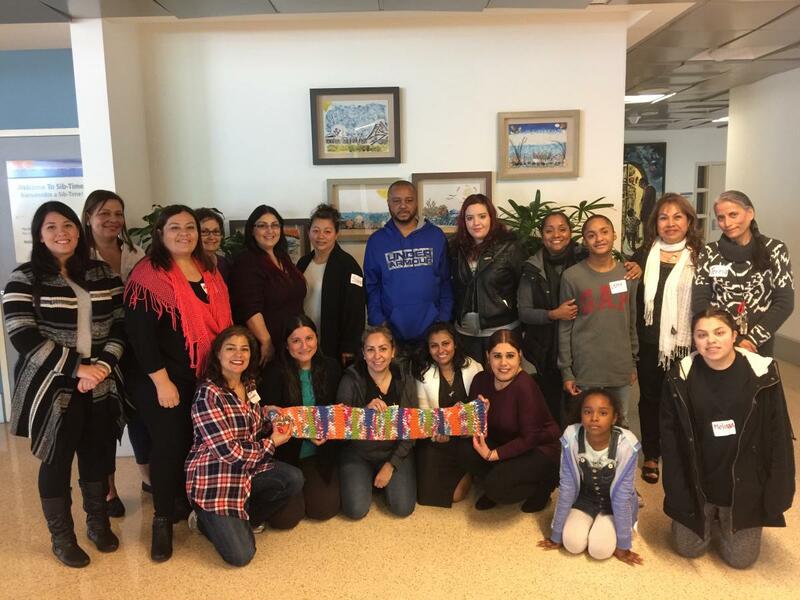 This past January 2017, CDBS hosted the southern California FSP meeting at Millers Children’s Hospital where Unidad y Fuerza Family Resource Center is housed. I am very fortunate to do the job that allows me the opportunity to be surrounded by wonderful parents that volunteer their time and are interested to help others in similar situations and have no fear to share their own good and bad experiences. 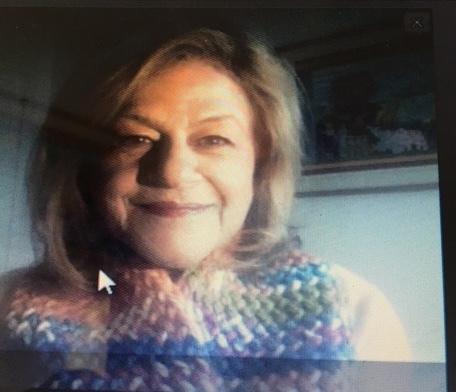 I was wearing the scarf around my neck during our monthly MasterMind conference call in the Adobe room with more than 25 Family Engagement Coordinators from around the country. 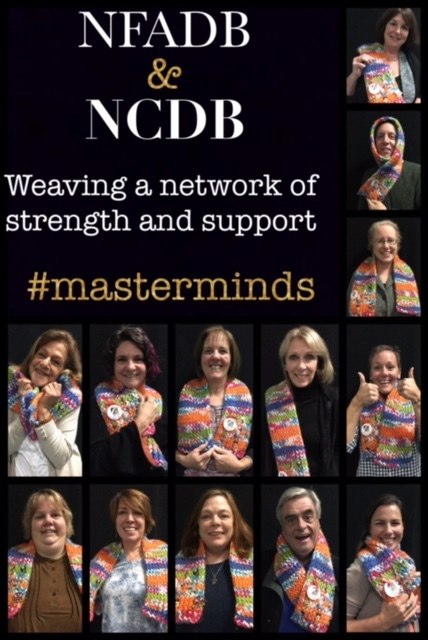 Given the energy that radiates from each one of the participants after the call, this scarf more than ever symbolized the worth of each individual, the support shared with one another, how tight knit, diverse, warm, colorful and vibrant this group is! 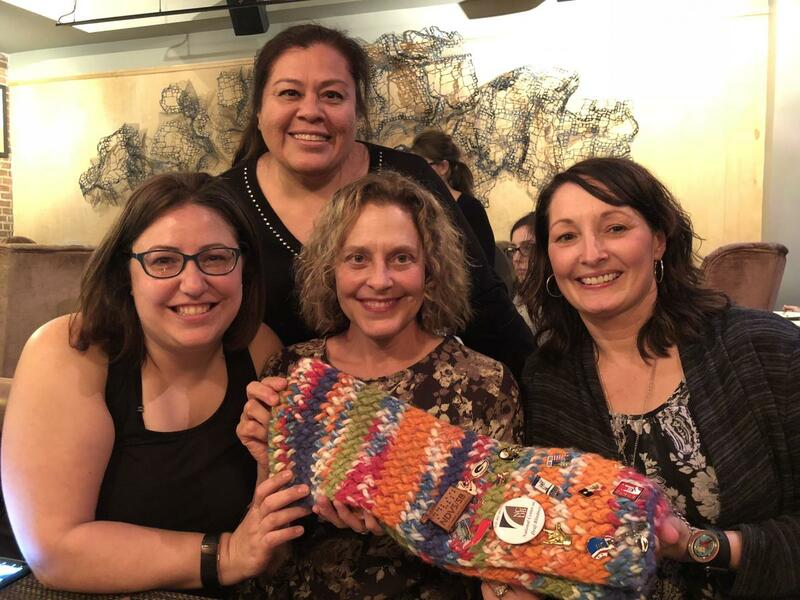 As the scarf moves around the country picking up a wealth of knowledge, good positive thoughts, embracing and saving all the passion for what we do, we can only think, what a blessing it is to have a circle of good friends interwoven so closely! My name is Edgenie Bellah and I’ve been the Texas DeafBlind Project Family Engagement Specialist since 2002. I love everything about my job, including working directly with families, facilitating family leadership training and supporting our fabulous family organizations. In addition to being the project’s liaison with the Deaf-Blind Multihandicapped Association of Texas, I have been fortunate to serve as the Texas Chargers, Inc. advisor since 2006. This year, Texas Chargers held their 11th annual family conference. This two-and-a-half-day family retreat is organized and facilitated by the talented family leaders who serve on the Texas Chargers Board. 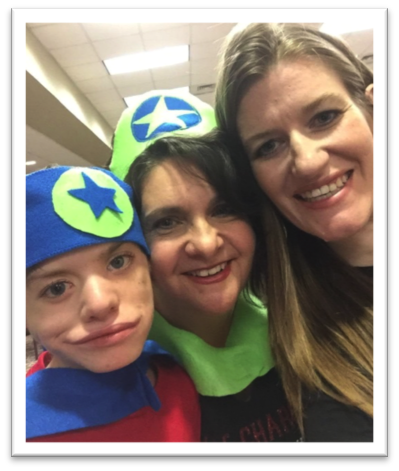 Families who have children and adults with Charge Syndrome came from all over Texas to share their joys and challenges and give the Charger children opportunities to meet friends so they know they are not alone. In addition to enjoying learning from each other, we had the pleasure of having Dr. Jan van Dijk as our keynote speaker. Our theme this year was celebrating our Super Heroes. While the focus was on the children and adults with Charge Syndrome, I personally saw it as another opportunity to reflect on the super hero power of our amazing family leaders. The pictures I selected to highlight the Family Engagement Coordinators’ Scarf have personal significance, as every family member has not only made a tremendous difference in Texas but for me as I continue to partner with them. Cathy Springer, an energetic mother of a two-year-old CHARGE child participated in one of the first Texas Family Leadership Series. As part of her family leadership projects, she elected to host “a party for families who have children and adults with Charge Syndrome.” She partnered with other parents and family members to host the first party in 2006. The one-day gathering was such as success, several family leaders stayed afterwards to brainstorm next steps. That day, the first Texas Chargers Board was elected and within a year, we gained our Non-profit status. In November of 2008 our attendance grew in numbers with 30 CHARGE people and 130 family members attending! Since then, our annual family retreats average 250 participants with close to 200 family members and 50 volunteers to provide camp activities for the young people. 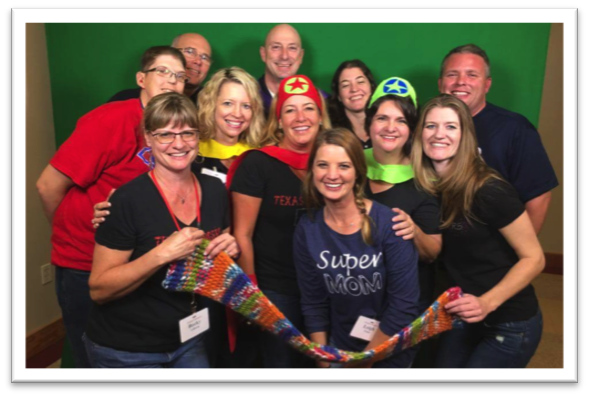 The Texas Chargers, Inc. is a group of Texas families, friends, and professionals who are dedicated to helping children and young adults who live with CHARGE Syndrome. The primary function of our organization is to support the emotional and educational needs of people with CHARGE Syndrome and the families and professionals working to provide them a better quality of life.